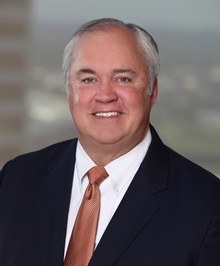 Former Judge Bob Jenevein joined Vincent Serafino Geary Waddell Jenevein, P.C. after 11 years of private practice and four years on the Dallas County Bench. Judge Jenevein presided over more jury trials and disposed of more cases in his first year on the Bench than any civil judge in the history of Dallas County. Every year thereafter, he served as the Presiding Judge of the Dallas County Courts at Law. Having experienced 250 jury trials in four years, Judge Jenevein is known for his expertise in jury selection, a topic on which he enjoys speaking. In 2001, CBS Evening News with Dan Rather ran an Eye-on-America spotlight on jury trials in Judge Jenevein's court. As a civil litigator before and after his tenure on the Bench, Judge Jenevein has handled a wide variety of cases, from personal injury and landlord-tenant disputes to complex commercial torts, and he has prevailed at every level of the Texas judicial system and in arbitration. His preference, however, is jury trials, on either side of the "v."
Jenevein is a veteran panelist with the American Arbitration Association (AAA) and an effective advocate before the AAA and the International Centre for Dispute Resolution. He has won over $70 million in awards for his arbitration clients. As a mediator in civil and family cases, the former judge has used his experience to consistently settle over 80% of the thousands of cases litigants and other judges have referred to him.